Charles Hard Townes received the Nobel Prize for Phyiscs in 1964 "for fundamental work in the field of quantum electronics, which has led to the construction of oscillators and amplifiers based on the maser-laser principle" He was award half of the Prize. The other half of the prize was shared betweeen Nicolay Gennadiyevich Basov and Aleksandr Mikhailovich Prokhorov. 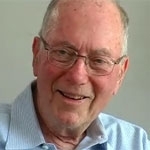 Video interview recorded in 2005 on his 90th Birthday Charles Townes is interviewed by Harry Kroto. Discussion of his research history and his philosophy on life including his award from the Templeton Foundation are discussed.